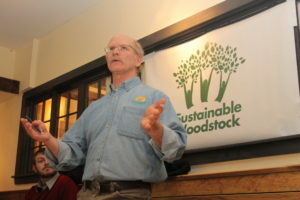 The Woodstock Energy Committee is an action group of Sustainable Woodstock. Its mission is to promote energy efficiency, conservation and the development and use of renewable energy sources among the Town’s residents, businesses, educational and municipal affairs. Contact us at energy@sustainablewoodstock.org. Doc Bagley of Catamount Solar speaking at a Sustainable Woodstock presentation on our Solarize project. The Energy Action Group holds informational sessions for Woodstock area residents on many aspects of energy use. 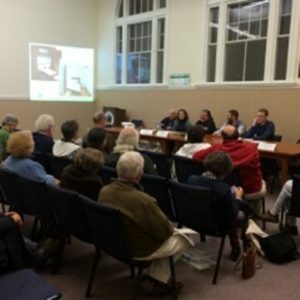 Shown here is a September, 2014 meeting at Town Hall on heat pump technology, where we explained how homeowners can save fuel and money. Thirty people attended this event.